Musical ideas can flow to a musician in a level that, sometimes, is hard to understand for anyone else that isn’t the musician himself/herself. Ideas can’t be controlled, and as you can pass many years without ideas, you can have many in a short period of time. 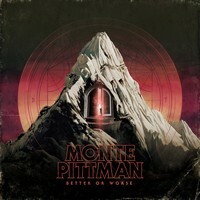 That’s the reason for “Better or Worse”, another album from MONTE PITTMAN is being release at the same time of “Between the Space”. But you better read my words until the end. If the other one is a Heavy Metal/ Rock album based on distorted guitars, “Better or Worse” is an acoustic experience, introspective and filled with a Country/Rock feeling. Obviously it’s a more accessible work than his twin brother album, but it’s rich on excellent melodies and charming arrangements. For those speed freaks and addicted to extreme Metal genres, this album can sound boring, but I truly recommend a listening for those that just want to hear, in the first place, good music. As it was with “Between Spaces”, Monte recorded and made the mixing of “Better or Worse”, with the mastering being done by Alan Douches. And for such musical format, to be clean is the first thing to search for, and it is as clean as you can expect, but with a musical atmosphere with a little touch of rawness, just to put things as organic as possible. Being a mirrored different album, this one is easier to be assimilated for fans of every musical genre you can think of, and the Country feeling of “Depth Perception”, the beautiful and tender “Turning Retrograde” and “Better or Worse” (both filled with easy melodies and charming musical arrangements), the lovely “Whose Side Are You On?”, and the seductive “Torchbearer” will warm your heart and soul. Just a simple hearing and you’ll be caught, no big deal! A great album, different from whatever you are used to, but “Better or Worse” is a courageous release, and it’s truly an addiction. Hear it, then put “Between the Space” on spin, and enjoy the experience!